** SEE A COOL VIDEO OF A FAMOUS CAVE!! Imagine standing on a crescent of powdery pink coral sand. Wavelets of tepid Caribbean water lap at your feet. You gaze outward towards the horizon over a sparkling azure sea topped by scattered marshmallow clouds floating lazily in a sapphire sky. 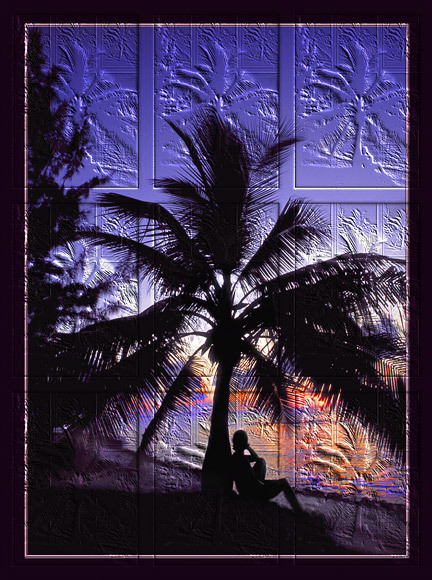 Light trade winds prowl through the swaying palms above you and the leaves of sea grape trees rattle ever so slightly to and fro. As you take a long, deep breath of the fresh sea air, time seems to slow and calmness begins to subtly invade your senses. The second largest of the Cayman Island ‘trio’, Cayman Brac is such a fascinating little place, far removed from the hurried pace associated with the world at large, where the ebb and flow of time is measured not by the clock, but by what crops are ready for harvest, what birds are migrating through, or when the orchids are blooming. The inhabitants are genuinely welcoming and friendly with a propensity for laughter. There is literally no traffic (not one traffic light), the beaches are uncrowded, the diving spectacular and scenery abounds like no other you have seen. Dining is offered in a variety of unique and unusual circumstances, and the few shops that display local artistic skill and crafts are usually found in a room within someone’s home. Besides an obvious opportunity for rest and relaxation in this lilliputian tropical paradise however, you might develop a distinct sense that an adventure may be hidden and waiting for your discovery. www.itsyourstoexplore.com, Planning your trip, accommodations. In 1996, the Cayman Government acquired and sunk a 330-foot long RUSSIAN WARSHIP as an artificial reef structure and dive attraction. It was named the M/V Captain Keith Tibbetts and its sinking was attended by numerous officials including Jean-Michael Cousteau. This is a spectacular underwater divesite, yet might NOT be there forever. Go HERE to check out its unique story. 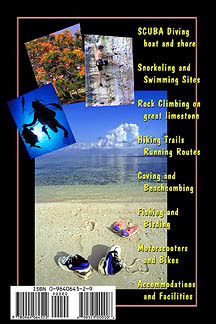 For further information on Cayman Brac, its attractions, accommodations, and facilities, be sure to go to www.naturecayman.com or www.LaEsperanza.net or www.itsyourstoexplore.com – or go to the LINKS page for lots more information. 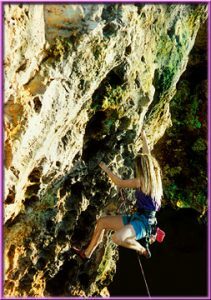 For up to date climbing information, more shots and commentary from visiting climbers, go to www.climbingcaymanbrac.com maintained by part-time resident and expert climber John Byrnes. *GO HERE FOR A REVIEW OF THE BOOK!! It was nearing 2:00 AM on Grand Cayman Island and the oppressive shroud of dense humidity was suffocating. I was fighting a nasty headache acquired from a rollicking time at Billy Bone’s Bar as well as an unquenched desire to climb. Knowing there was nothing higher than the Hyatt Resort clock tower on the island (the highest geographical point on Grand Cayman is 18′! ), I settled for traversing the coral block walls of the Owen Roberts International Airport – and got caught by the local police! Without doubt they thought I was ‘under the influence’, and upon spying my little bag of white powdered gymnastic chalk, they knew it for sure! After being taken to Police headquarters and questioned for an hour, I finally convinced them of my generally intact mental status and harmless intentions. One smirking gendarme said “you should go try the Bluff on Cayman Brac Mon, they gots some high cliffs on that place over there”. WHOW!! I headed out over 90 miles of open water towards Cayman Brac by seaplane right after sunrise. Looking down through bloodshot eyes, the island appeared out of the haze like a little paramecium floating in a cobalt blue expanse of sea, and much to my amazement, there really was a vertical adventure land on its northern tip. And in my rather fragile state, I had little problem imagining how it must have been when these remote islands were first encountered by explorers centuries before. During his fourth (and final) voyage, Columbus was heading for Cuba when he was blown off course by a storm of prodigious proportions. Consequently, he mistakenly came into sight of a small, but long island with a thin strip of coastal plain surrounding rocky highlands. He noted in his log on the 10th of May 1503, that “we are in sight of this island … full of tortoises, as is all the sea about, insomuch as they look like little rocks”. He claimed the island (actually all three Cayman Islands, known today as Grand Cayman, Little Cayman and Cayman Brac) for Spain and then the little triad of islands languished for nearly another century in the warm tropical sun awaiting further discovery. Sir Francis Drake sailed through Cayman waters on a land acquisition mission for England in 1586, claiming the islands and named them ‘the Caymans’ for the presence of “many great serpents … large lizards, which are edible” (Caymanas is the scientific name of marine crocodiles). 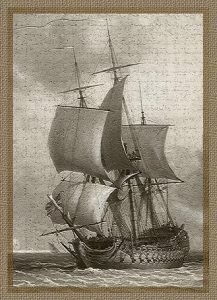 Soon, the activities of the fearsome, lawless ‘Brethren of the Sea’ (Pirates) began to escalate and the Caymans made a great hideout, providing many small natural inlets which were well protected by dangerous hidden reefs. 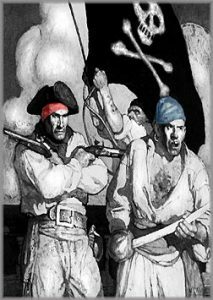 Characters as infamous and hideous as Blackbeard, Calico Jack Rackam, Henry Morgan and Ann Bonney walked the Cayman shores. Of course, nowhere in the Caribbean was there better hiding places for booty than the caves along the Bluff walls of Cayman Brac. Perhaps these really were the first known safe deposit boxes – and perhaps the pirates turned into climbers to get there … we’ll never know. Despite their seemingly colorful history, not many came to these islands voluntarily. The early mariners came only to provision their ships with fresh water (mainly from the Bluff’s convenient aquifer) and stock up on turtle meat, leaving as soon as they could. There was virtually nothing else of value to be found. Aside from being far away from the main trade routes like the Windward Passage, it was an extremely inhospitable place. One could not walk here without risking serious injury from a fall on razor sharp ironshore (rock they call ‘Hell’ on Grand Cayman today), there was almost no tillable soil and the inland swamps swarmed with biting creatures and dense clouds of ravenous mosquitoes. Today, however, things are very different. Grand Cayman is a tourist mecca, receiving over 1.3 million visits per year not counting over 900,000 visitors from cruise ships. It is a financial hotspot with over 600 banks and investment firms represented within its shoreline, the fifth largest financial center in the world. Over 850,000 divers come to Grand Cayman each year to enjoy the underwater spectacle of pristine visibility, highly decorated reefs and a wide variety of fish species. However, things are different on Cayman Brac. It is a small, laid back place consisting of about 1,500 hearty individuals mostly stemming from a few core families that settled here around 1850. Everything moves along on “island time”, roughly half-speed, genuine friendliness and warmth prevails, there are no traffic jams and not one traffic light. The fact is, a Cayman ‘Bracker’ of 75 years ago would still find much that was familiar to him in the everyday scene today – EXCEPT CLIMBING! 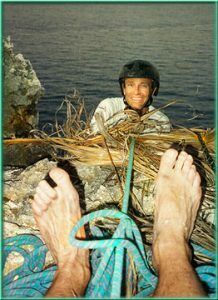 After my impromptu plane ride two month’s before, I returned to Cayman Brac like a pirate in search of treasure with a trusted climbing buddy, some bolts, a rope and a dream in August of ’94. Through a stroke of luck, I convinced Ernie Johnson there was great climbing and diving on ‘The Brac’. I didn’t mention that I hadn’t set foot on the island, but I just knew things would pan out. One learns to improvise in a forced situation like this. 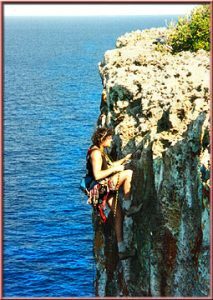 Bolting sport routes on limestone at sea level in tropical conditions proved more than we had anticipated. We guzzled water by the liter and roasted like pigs on a spit in the relentless heat. We quickly found out the color of the rock correlated with ‘sharpness’, buff for buttery smooth and dark grey was similar to the main course at a piranha feeding frenzy. Ernie named the first route after looking me over when I returned to the ground from bolting it – the top 1/3 was grey in color! He called it “CHUM BUCKETS” – use your imagination. Moreover, half of our gear hadn’t arrived and neither did Ernie’s clothes – getting to Brac was difficult back then. 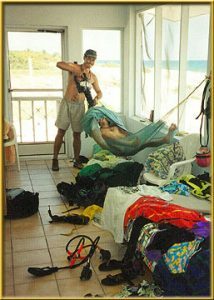 The gear came the next day, but Ernie’s clothes didn’t and we ended up sharing my 4 pairs of shorts for 5 days – not good!! We did manage to finish two routes near what we called ‘the Orange Cave’ on the southeast coastline and left the island with tails dragging. World traveler, climber, diver and magazine owner/publisher George Bracksieck tops out on a North Wall route at sundown. By this time, we were protecting our ropes from abrasion with palm fronds. I think he liked this climb!! George staked his claim on the exact Northeast Point of the island, so he put in “What’s the Point”, a great recreational bucket pull right there. Forever the hardest of hard women and competitive sport climber, Liz Grenard starts up her very first climb on Brac near the Orange Cave. We all agreed that the climbing here got a little sharp up high, so we set off to explore the rest of the Bluff. After chartering Shelby Scott to take us around the entire North End by boat, we started scouting out the North Wall. Liz started bolting right away, and some of her very best work, like “Frolickin Frigates” and “Parrot Preserves on Rye”, is found at Wave Wall. Here’s Craig Luebben heading out for a normal day’s work … (if you consider bolting a 5.11c sport route over pounding waves in the middle of the Caribbean Sea “normal”). 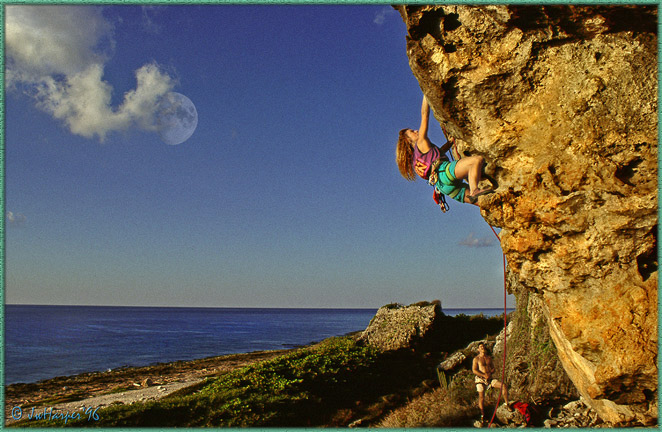 I’ve seen the same scene on Mona Island off of Puerto Rico, when we went to Cuba to find climbing there and many other places. He’s always the same, full of energy, very highly skilled and someone hard to keep up with – but you want to. Craig was only on Brac this one time, but his inventive routes like “Going to Cayman with a Snorkel in my Jeans” and “Pillage and Plunder” are a telling remnant of his presence here. Jim Roberts is a climber and EMT from Las Vegas. Here he is practicing his trade by giving a loudly snoring Luebben a lobotomy with a power drill. This was probably the only day I have ever seen Luebben not up before the sun, a fitting commentary on how much effort it took to climb, bolt routes, dive and party – all in the same 24 hour period in the tropics. What a tough life. 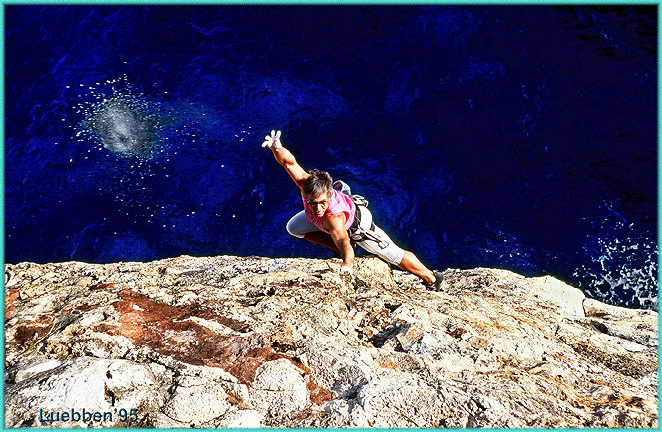 By the end of our trip, we added 18 more exciting routes, mostly along the spectacular North Wall overhanging the sea. 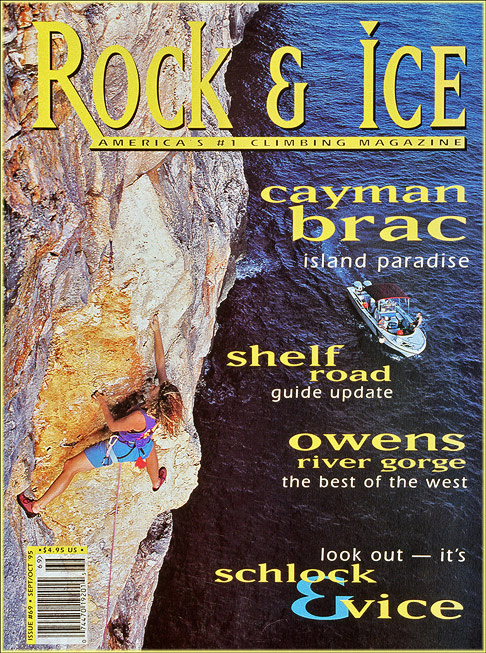 This adventure was written by Luebben and me as an article published in Rock & Ice Climbing Magazine entitled “Hidden Treasure” (Vol. 69, 1995). Since then, several individuals, of particular note Jeff Elison, Liz Grenard and (less so) myself, have contributed climbs in additional areas to take advantage of secluded locations or those more difficult to access (see a second article by myself called “Back on Brac; New sport routes on Caribbean Limestone” in Rock & Ice, Vol 101, 1997). Today, there are nearly 80 climbs on the island, a couple of 5.8’s, a few 5.9’s, and many from 5.10 through 5.12. There’s also a home owned by climbers within walking distance of some climbs, a testament to their dedication, tenacity and how much they enjoy living and climbing here. 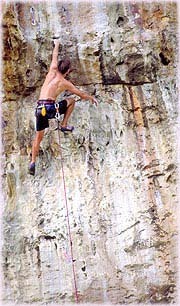 “THE BLUFF” is composed of limestone, a highly prized climbing medium. It is steep terrain, about 150′ high, peppered with dissolutionpockets, caves of many sizes, stalactites and flowstone. It has a generally smooth consistency where climbing is found, although it is characteristically sharp and user ‘unfriendly’ in other locations. 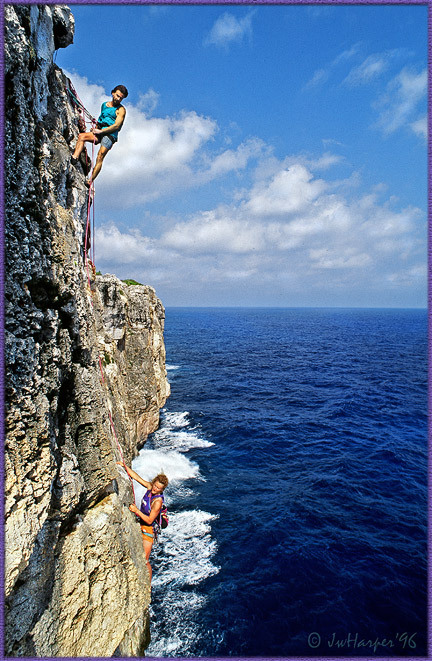 While some of the Bluff’s walls can be approached by land from below, over half of the walls rise abruptly out of the churning Caribbean Sea (climbing at these locations is even more exhilarating). Interestingly, the limestone found on Cayman Brac compares favorably with other high quality limestone areas around the world including the mogotes of CUBA, the valleys of Southern France and popular areas of southeast Asia. (The shot is SH on ‘Hermy the Crab’ found on the spectacular North Wall). **NOTE: Some routes are tagged (‘T’) for identification purposes, usually with a small yellow tag attached to the rock above any given route. Bolt counts are indicated as 2/12/2 (2 top anchors, 12 bolts on the route, 2 bottom anchors) or 2/12 (2 top anchors, 12 bolts on the route). The routes in the Spot Bay area are approachable by land. The routes along the North and East Walls are approachable ONLY from the top, ie rap down to bottom anchors and pull the rope. The Northeast Point of the Island is very near the light towers at the east terminus of Major Donald Drive. Climbs on the South Side are approachable via the beach. (Shot is of Greg Diamond on Dixon’s Delight, Dixon’s Wall in Spot Bay). Many of the original bolts placed on the island have experienced Stress Corrosion Cracking (aka “SCC”). This is becoming an all-to-common, yet DANGEROUS phenomenon on sea cliff routes worldwide, one that seriously weakens the placements and causes accidents/injuries. A project to re-equip all routes with TITANIUM HANGERS called Tortugas from Ushba Mountain Works was begun in November, 2000. Over half of the existing routes have been re-equipped so far. Therefore, it is suggested that you climb only the re-bolted routes which are indicated by ‘Ti’!! For more information on this project and interesting particulars on SCC, go to www.Ushba.com. *Remember, Ti = Titanium Hangers!! See the map on the main Cayman’s Page for some details. there is much more JUST OFFSHORE!! Under water, one finds a riot of color and movement, with an abundance of invertebrate species and a wide variety of entertaining fish. There are wrecks (one a 300′ Russian warship complete with missile tubes and guns fore and aft), towering coral heads, impressive dropoffs into inky darkness and gigantic sand chutes. Conventional BOAT DIVING is highly regarded, and while still in a formative state, SHORE DIVING is becoming more popular. The visibility on Cayman Brac is superior, usually ranging from 150′ to 200′ with tropical temperatures ranging from about 78-82 degrees – very accommodating. All considered, ‘The Brac’ is a true water lover’s dream. It is simply no wonder that divers from around the world continue to ….. ‘come back to Brac’! Today, there is only ONE dive operator on Cayman Brac. Reef Divers are associated with the Brac Reef Resort. This highly professional dive operator can take you to a variety of exciting dive sites around the island, distant dive sites seldom seen, or on a ride across the channel to Cayman Brac’s ‘sister island’, Little Cayman to experience world renowned wall dives. Reef Divers is also well versed in shore diving support. 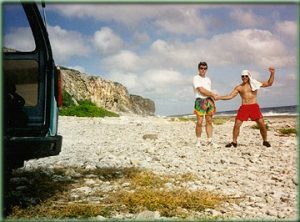 Ref: ‘Adventuring on Cayman Brac’. BEACHES, SUNNING AND SNORKELING SITES MORE TO COME . . . . I will get to this!! 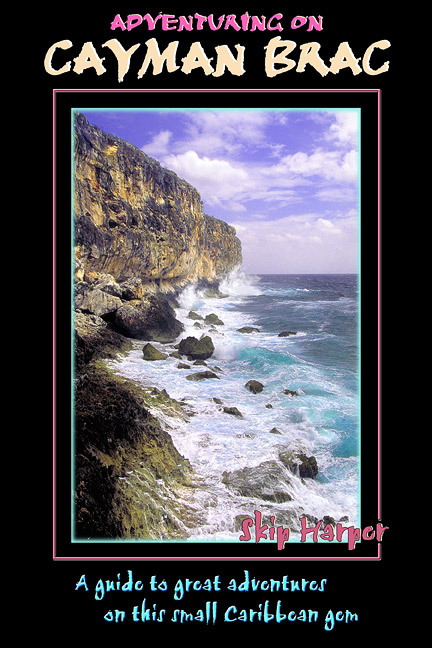 The caves on Cayman Brac are ‘littoral’ caves, typical of those found along the seashore in many parts of the world. 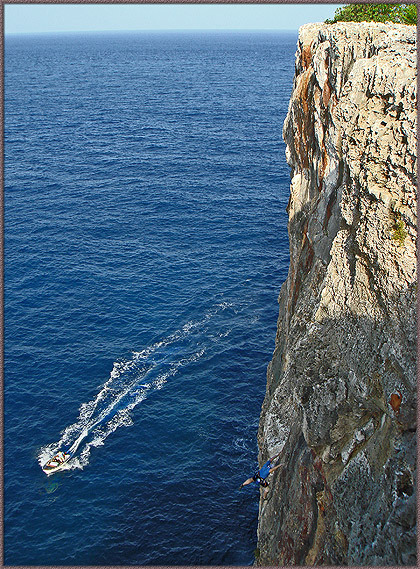 The ‘Bluff’ runs along most of Brac’s length, rising from little height on the SE end of the island to about 150′ at the NE Point. It is composed of limestone, riddled with caves of many sizes. Some are visited frequently and some are more remote, existing in a raw, primitive state. Although not nearly as expansive as those found on nearby Cuba or Puerto Rico, many offer attractive interiors worthy of exploration as shown below. In fact, some might be considered as captivating miniatures of more well known caverns. Some are as colorful as an artists palette, due to algae and the oxides of trace minerals. Most are not difficult to negotiate and require little specialized training or gear. In fact, any adventurous fledgling caver can explore their spelean riches with little preparation and minimal physical exertion. Bring along a head lamp or a dive lite and watch your topknot!! 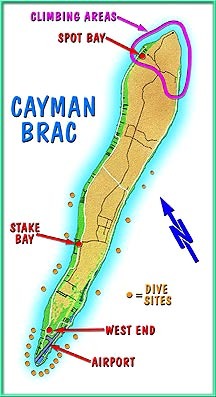 A map of many of Cayman Brac’s caves. The highly decorated interior of the Bat Cave, located on the south shore. Accessible by walking-in. Number 12 on the map. Partial interior of Rebecca’s Cave, a National Heritage Site in remembrance of the tragedy of the 1932 Storm. Another ‘walk-in’. Little Rebecca Bodden lost her life during this storm and is buried here. Number 13 on the map. **SEE MORE ABOUTTHIS CAVE ON YouTube!! Flowstone draperies in ‘Shelby’s Bolt Hole’. This one requires some scrambling and light down climbing. Number 3 on the map. Artistically colored roof of an undisclosed cave. Sorry, the location is secret. Exploring the ‘blue room’ of Neptune’s Lair on the rugged NE Shore. A good hike (Long Beach Walk) and scrambling over nasty ironshore will get you here. Mostly easy, but some light scrambling may be necessary in the deeper recesses. Number 6 on the map.